Our team of experts is fully equipped with knowledge and technical skills to deliver excellent gate and garage door services. We are a leading company not just for garage door but also for all gate services. Garage Door Repair San Diego is well-known for years because of its outstanding expertise in handling garage doors. We continue to aim to provide safety and security for all residential and commercial areas. Our company has invested time and money to train every technician in our team to become experts in gate repair no matter what type it is. We aim for perfection and that is because we value our clients and strongly believe that they are the ones who continue to make our business better than ever. Before we offer gate or garage door service, we make sure that we are fully ready and prepared to handle any situation. Professionalism is a character we always bring with us no matter what we do. From the time we get a service request till we finish with our work, we remain well-mannered, prompt and courteous. Our flexibility is incomparable to other companies. Our contractors are knowledgeable in all types of gates whether they are manual or automatic. We spend time studying every mechanism and feature so that we can provide information to our clients if they need recommendation. We are precise with measurements so we can fit new gates perfectly. If you have problems with your gates, we inspect all parts so we can really identify the cause of malfunction. We do not replace parts if it’s not necessary. We are equipped to conduct welding repair perfectly especially on damaged hinges. Our technicians do it flawlessly and quickly so you have a gate that works perfectly in minutes. If you have a gate installed, it is important to have an intercom system for convenience and added security. Our company partners with the best manufacturers of intercom systems and our clients can be assured that we know how to handle the brand we recommend. Our expertise is not just for residential but also for commercial gates. It is important for businesses to have gates especially in areas where they store their products. 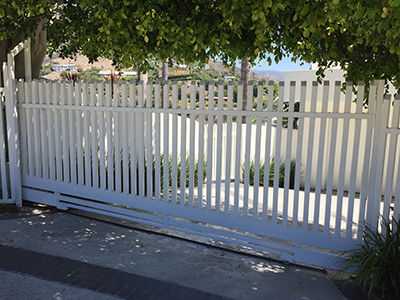 This type of gate is larger and heavier so it is important that it is properly maintained by our technicians. This will ensure a long lasting gate and prevent serious damages. If you need to replace worn out parts, our skilled technicians can do that with ease and efficiency so we can meet customers’ standards and satisfaction. We have all spare parts available with us so there is no need to spend time looking for replacement. Who else can give you the best? There is no other company like Garage Door Repair San Diego so entrust all your gate needs to us. We are just a phone call away so pick up that phone and call us now!